OBJECTIVES: Laparoscopic repair has been widely used for uncomplicated ventral hernia as it is associated with fewer post-operative wound complications and a shorter hospital stay. We explored the safety of porcine collagen coated mesh (Parietex™Composite, COVIDIEN®) in emergency laparoscopic repair of acutely incarcerated ventral hernia. METHODS: Laparoscopic repair was attempted for patients who presented with acutely incarcerated ventral hernia. Those patients who had signs of peritonitis, who were hemodynamically unstable or who were anticipated to have extensive adhesions were excluded. 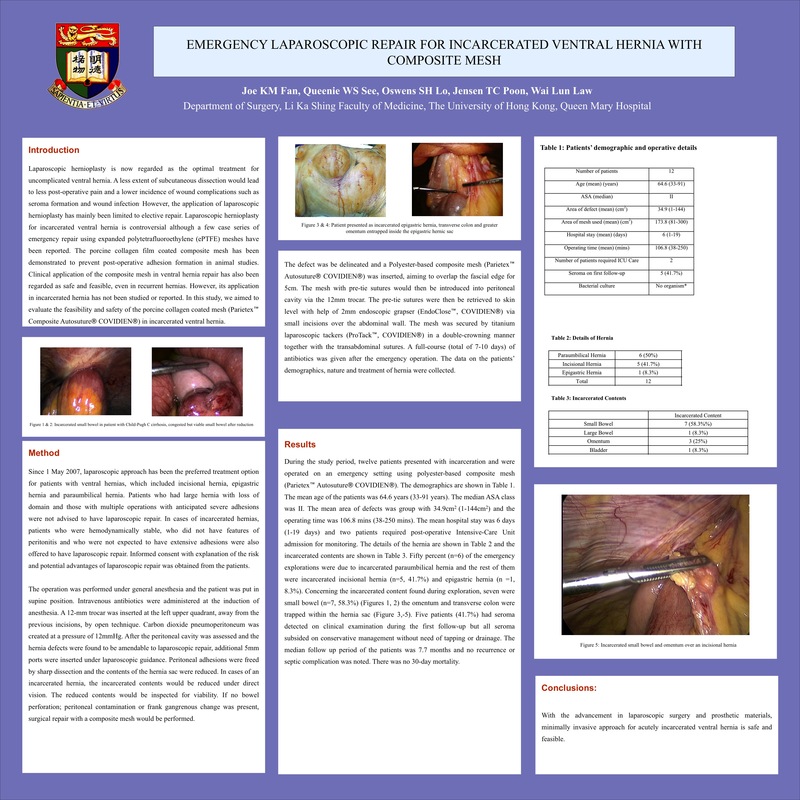 Laparoscopy was performed and the adhesions were freed with sharp dissection, avoiding damage to the bowel. The mesh was placed with 5 cm overlap and secured with tackers. The outcomes of surgery were evaluated. RESULTS: Twelve patients who suffered from acutely incarcerated ventral underwent laparoscopic repair with Polypropylene-based composite mesh during the study period. The mean age of the patients was 64.6 years (33-91 years). The median ASA (American Society of Anesthetist) class was II. Six patients had incarcerated paraumbilical hernia and the rest of them were incisional hernia (n=5, 41.7%) and epigastric hernia (n =1, 8.3%). The incarcerated contents were small bowel (n=7), omentum (n=3), transverse colon (n=1) and urinary bladder (n=1). The mean area of defects was 34.9cm² (1-144cm²) and the mean operating time was 106.8 min (38-250 min). No intraoperative complication occurred and the mean hospital stay was 6 days (1-19 days). There was no mortality and two patients required post-operative Intensive Care Unit admission for monitoring. Five patients developed seroma and all subsided on conservative management. There was no other wound infection. CONCLUSIONS: Minimally invasive approach for acutely incarcerated ventral hernia is safe and feasible by using the porcine collagen coated polypropylene meshes. The outcomes of surgery are favorable and wound complications.can be reduced.